I watched a toddler walking on the pier, looking fascinated down at the green ocean between the rough planks. I remembered being a child and the cracks looked so big. I always thought I might fall through and the thought terrified me. It seemed so possible! I wanted to warn the people never to make jokes about falling through the cracks with their sweet daughter, so she might be spared the terror I felt. But then I thought that the people would probably be freaked out by a weird lady talking to them about something like this, and I decided not to. The day was windy and I was wearing a light knit skirt. I was kept busy clinging at my skirt, trying to keep it from flying up around my waist. 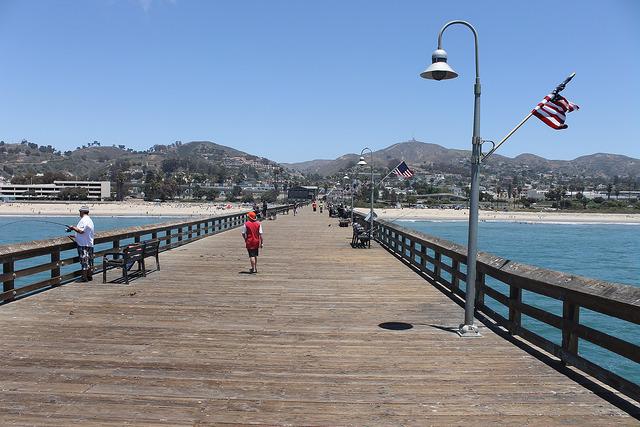 I was also hunting Pokémon, because our pier, the longest and, in my opinion, finest, fishing pier in California, is a Pokémon hot spot. There are seven Pokestops on the pier and a gym, and usually several, if not all of the Pokéstops are luring. My apologies to non-Poke-people here. I went out and captured a glorious number of mon. I got beat twice at the gym, but it is held by my team (Mystic!) so no matter. On the way back, I dropped my phone. It landed almost flat but then, almost magically, sprang up and, with perfect precision, dove sideways down through the crack in the pier. It didn’t touch either board. It just disappeared silently between them. I looked at the crack and at my empty hand. I may have sworn at this point. Maybe. It seemed so clearly like the phone NEEDED to dive through the crack that I was more stunned than upset. I have a new phone. It looks like all my contacts didn’t move over, so you may need to call me. I may not play Pokemon on the pier anymore. And I’m going to wear my big shoes so I don’t slip through the cracks. You never know. I still have a really hard time with piers and open metal grates. Big shoes help some. I know! And I dragged you out on that ledge at the Getty Center! Sorry! Love you. Hopefully the chances of you ever being able to pull the same stunt off, is like 1 to a million. Hope your Pokemon transferred. Wow, that’s crazy. Sorry about your phone and your Pokemon. I wonder if you stood at the foot of the pier, if you could lure them to you? At least what happened was relatable to teens. They were likely horrified, and could tell stories about it at school as a warning about the pier. Now I am a pier evangelist, telling people, “You know, I LOST my phone out here…” The pier is such a great pokespot. Ack! Sounds awful! I too used to be scared of cracks too because I’m scared of heights! No idea about the Pokemon thing though LOL!! I decided not to be lured into playing it since it does sound very addictive!! If you have an addictive personality, DO NOT START. It is fun but it takes over your life.